Rarely accessed content doesn’t mean unimportant. Now it’s easier than ever to protect, reuse and securely share your electronic records at a global scale. Cut costs by decommissioning legacy systems, gain a durable, highly available secure cloud archiving solution and repurpose your storage infrastructure for critical business activities while maintaining compliance and information governance. 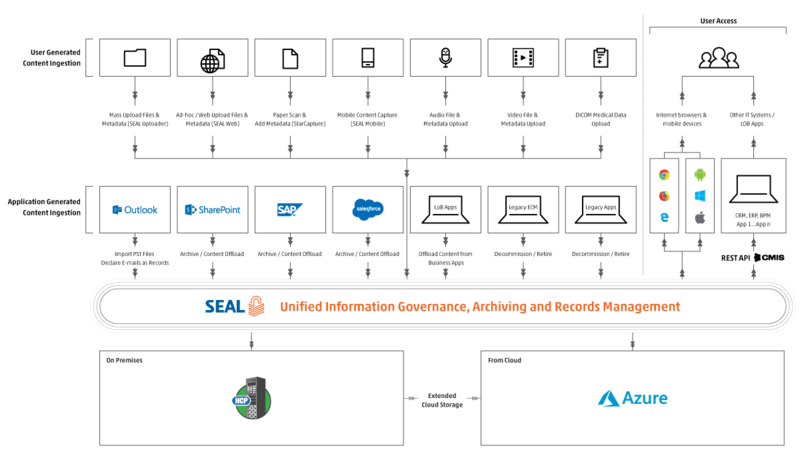 Azure Documents Archiving (powered by SEAL) provides a unified enterprise archiving and records management platform that stores unstructured content and related metadata in a single, consolidated repository. Now organizations can preserve and unleash the value of their information assets while gaining access to the highly flexible and compliant archive storage environment of Microsoft Azure. Simple. Powerful yet simple interface delivering the best user experience. All-in-One - designed as a content services solution to address full content management needs, including document capture, OCR, workflow, records management, life cycle and archiving. With Azure Documents Archiving powered by SEAL you can optimize the records management activities while reducing the burden on records management staff. Rarely used content doesn’t mean less important content. With a centralized repository based on the flexible and compliant Azure environment you can easily consolidate multiple archive repositories and release core business infrastructure rather than using expensive multi-purpose platforms (such as Enterprise Content Management solutions) for archiving. Find all your documents at a click, reuse them and win valuable time and resources by working efficiently with SEAL’s added benefits. Build your Unified Information Governance at global scale leveraging Azure deployments. Capture, transform, index and securely manage your entire paper and electronic archive, leveraging a centralized records management delivered from Microsoft Azure repository that will put you lightyears away in front of your industry. Store, find, reuse and share your valuable documents;Manage valuable business content based on what it is rather than where is stored. Reduce the load of databases supporting the business apps. Leverage the true power of content mobility using our dedicated clients for iOS and Android and CMIS implementation that allows you to easily view and access content like never before from a variety of systems or devices. Unleash anytime, anywhere the power of your corporate information assets just sitting there, in your day to day business processes. Competitive pricing vs. traditional DMS/ECM, legacy applications and platforms;Eliminate the cost of losing or re-creating existing documents. Become more efficient just by reusing existing documents. Secure your valuable content with dynamic security based on metadata. Give access to as many employees as needed empowering them to do their job better and faster. Increase collaboration efficiency while keeping information control by having a digitally shared workspace with third parties thanks to document collections and time-boxed security. Intuitive yet powerful interface that will put your mind at ease and transform you into an information superhero.